When am I going to be happy? The author of 'Taking Out The Trash' shares her tips on how to be happy. What does that mean? To most people the term "happy" means joyful or contentment. 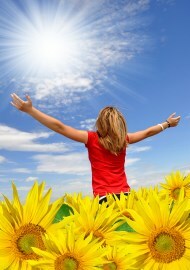 People associate "happy" with any positive feeling they experience in life. We are happy when we are content, loved, satisfied and accomplishing a challenging task. Does this mean the same for "divorced people"? We are not like "most people". We are "divorced people". When are we going to feel joy or contentment? When will we feel satisfied and loved again? As we go through the different stages of divorce we stare blankly at life moving all around us and just shake our heads, look up at the sky and say "I just want to be happy!" If you are going through a divorce you need to take a step back and think of when in your marriage you were last both happy? Regardless of who wanted the divorce, there were symptoms leading up to this most devastating breakup. Everyone who first starts out on any journey in life is happy. Then obstacles get in the way and we have to find another way to be happy. In every stage of life, we step out of our comfort zone and grow. It is awkward, challenging and miserable at first. When we entered high school, freshman year was difficult. We used to think back on how happy we were in middle school. Once we found our groove, high school turned out to be the greatest years of our lives. Then it was time to grow again. We turned eighteen and stepped out into adulthood. Some went to college, some got their first jobs. We were miserable again. We woke up every morning with new responsibility; dragging ourselves to the shower at the crack of dawn. As we were embarking on another day of adulthood we thought "oh gosh I was so happy in high school, when will I be happy again?" Then we started gaining some swagger with work, income and the balance of friends and family. Happiness seemed to finally be at our grasp. Next, life brought on love, then marriage. It was a tough transition sharing everything with someone else. There were growing pains with living together and building a solid foundation. But this was the first time we had love in our lives. Love took the misery out of these challenges and made them exciting, eventful and exhilarating, as life took on a whole new meaning. I was never so happy until tragedy struck my marriage and drugs took over my happy little life. I could not fathom the fact that my husband left and I was going through a divorce. This scenario was not supposed to happen to me. I woke up day after day wondering when my suffering would end. No one pitied themselves more than me. I just wanted to be happy! After an entire year of sulking, dragging my knuckles on the ground and waiting for someone or something else to make me happy, I finally saw the light. I realized I was in the growing pains portion of a new stage in my life. This was the misery, the discontent and awkward part of a new chapter in my life. I had to stop looking back as I always had, wondering "why couldn't I be happy like I used to be?" I had to work through this and take my own measures in creating a new life again. I finally figured out that no one else was responsible for my happiness. I also felt invigorated at the thought of making myself happy after all these years of fighting for an ill-fated marriage. I was exhausted from the horrible ending to my marriage. I was really starting to feel hopeful that I had this awesome chance at creating a new me again! "Maybe I could finally be happy!" I thought. But what does that mean? It means different things to different people. Only you have to wake up and go to bed being you every day. What does being "happy" really mean to you? Let us start small and get you thinking about being happy as a tangible reach within your grasp. I will share with you some easy ways you can start to be happy again. It's all within your reach. Happiness will be in your future, I promise. Let's start by making a list of the top five things that would make you happy right now. Rome wasn't built in a day, just pick five. Keep it simple; let's take this one day at a time. Maybe you are happy taking long walks, having dinner with your best friend or playing that game of golf or tennis that you have not had the energy to do in a while. Scribe the list. Make it tangible, feasible and fun! It is one thing to write down the list and another to follow through on its content. This should be easy as your list is small right now. First take a deep breath, remember this is a new journey. I bet it has been a while since you smiled never-mind "being happy". So let's start smiling. Get into a groove, let these simple things start to become routine. When was the last time you took up a hobby for yourself? Now is the perfect time. You will see such an improvement in your attitude and happiness just might seem possible again. Start journaling as you embark on the road to happiness. It is really amazing to read back and reflect on how much your mood has changed. You'll find that doing things for yourself starts to become addicting! Maybe what you thought was the key to being "happy" again is a lot different than when you got married. You are different from when you were married. Life is different. But if finding love is still on the docket for "being happy" all is not lost. You are absolutely deserving of finding love again. The key is to love yourself first. Be comfortable with yourself first. As soon as you find happiness in sitting with yourself enjoying any of those things on your list, positive energy will pour out from within and you will be happy again. Now that you are feeling better, guess what? It's time to make another list. This time get a bit bolder and a bit more adventurous. It will become easier and easier to tackle these accomplishments because you are amazing. Keep looking ahead. Move forward and don't look back. You will see that this is just another cycle of growing in your life. That discomfort and struggle in the beginning of any change in life will soon disappear. The key to being happy again is all within your grasp and starts with you. You can do it! If you can survive divorce, you can do anything! Antonia Ragozzino a professional writer, adjunct professor for a Connecticut University, as well as a developmental skills trainer for a large media company. She is also the author of the "Taking out the Trash" series of books.